Sequin top - Lashes of London @ River Island // I got an email the other day from my mum saying that she'd seen this top on the River Island website reduced from £45 to £15 in the sale and she'd ordered it for me for when I get home! I had no idea River Island even stocked Lashes of London but I'm so in love with the sequins and colours on this t-shirt, it's so beautiful and mermaid-esque. I would never have paid £45 for it but that kind of reduction is hard to ignore -for £15 I think it's a complete bargain and I'm so happy my mum snapped one up for me, it reminds me of the Motel Rocks sequinned dresses and skirts but I think the style is a lot more wearable. The contrast of the sequins with the sheer black sleeves and back is also really cool. Swarovski decoden iPhone 5 case - Xsorize Urself @Etsy // This one is a bit of a cheat because it arrived yesterday but ah well, it's so pretty! A new phone case was on my list of things to get whilst in America because my old one has gone a bit gross and manky, so I had a look on Etsy (I could honestly trawl that site for hours) and voila! I love it, it's so girly and cute and sparkly! Iridescent purse - Deena and Ozzy @ Urban Outfitters // I've been after a new purse for a while now and this one from Urban Outfitters is perfect! 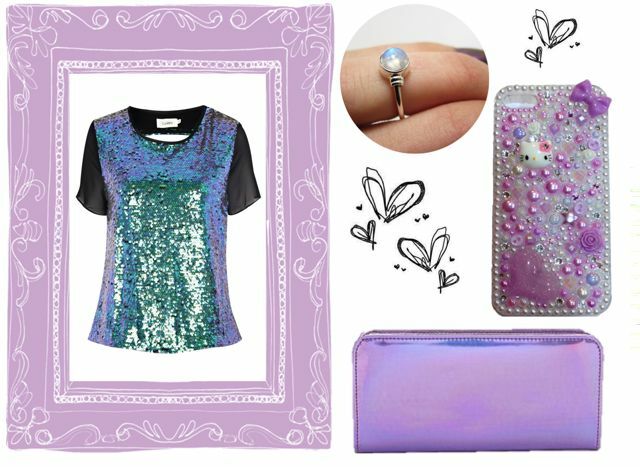 As you can probably tell from the colourscheme of my blog, it's my favourite colours all rolled up into one iridescent purse of prettiness (aww). I'm just really worried it isn't going to arrive in time, I fly back on Friday and I haven't heard anything about when it will arrive, keep your fingers crossed! What do you think of my purchases? Have you taken advantage of the January sales? i LOVE the moonstone ring. you have amazing taste darling! aaaw i love the phone case and purse- so cute! The top and the iPhone case are amazing! So super cute, I am looking forward to see it!